The first Lutherans came to the Jeffersontown area following the Revolutionary War, in search of a place to make a home and become part of a community. 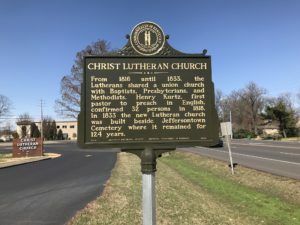 Two hundred and twenty-five years later, new members of Christ Lutheran Church in Louisville, Kentucky, still come searching for a home and membership in a community of worshippers. Our history is rich with tradition. Christ Lutheran Church has always had high participation in the surrounding community, as well as involvement with other congregations of different denominations. In addition, the church has always put a high focus on children and youth in the congregation with innovative programs and activities. Sunday school for both children and adults has been offered to the congregation since 1834. Christ Lutheran’s members are like family, the church a place where we come together for worship and fellowship. We share meals together often and take pride in belonging to a congregation that has persevered and continues to MAKE CHRIST KNOWN. The founders of Christ Lutheran Church had the following names: Geiger, Yenowine, Blankenbaker, Brinkman, Frederick, Durr, Nunamaker, Miller, Potts, Conrad, Bence, and Christler. Some of these names remain important in our lives today; we recognize them as street names and neighborhoods. The church received the first of its 38 Lutheran pastors, Samuel Mau, in 1789 just two years after the signing of the Constitution of the United States. Pastor Mau was a circuit pastor, and was shared with a congregation in Nelson County and in Danville, Kentucky. In 1796, the German Reformed Society built a small log church that was used for several years and was called The First Evangelical Lutheran Church in Kentucky. Another pastor, the Reverend Zink, replaced Pastor Mau. It is believed that Pastor Zink stayed with the young church about 10 years before moving to Indiana. The pastoral position remained vacant until 1818 when the Reverend Henry A. Kurtz was called by the church and began to preach in English. In 1816 the old church was torn down and a union church was built and shared by all the denominations in Jeffersontown. In 1833, the Lutheran Congregation purchased three lots and constructed a church of their own. 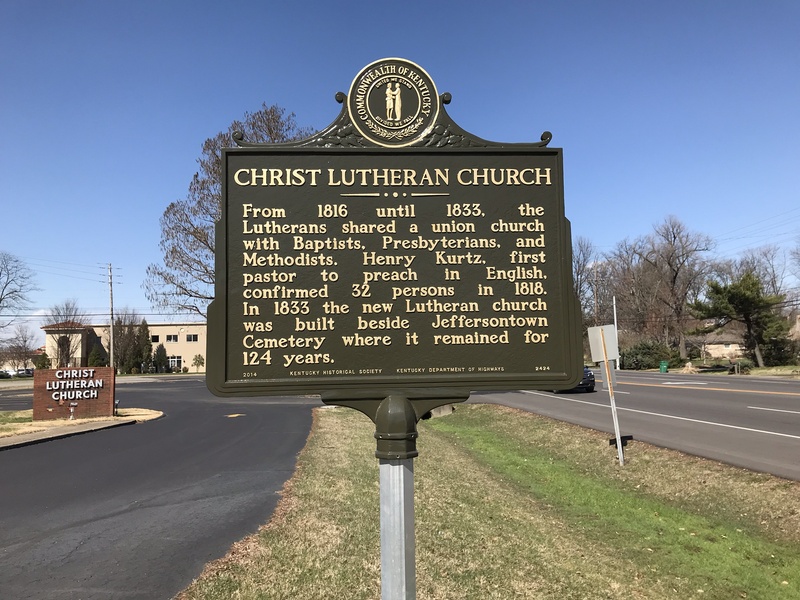 On September 29, 1833, Christ Lutheran Church was dedicated in Jeffersontown, Kentucky. The spiritual condition of the church underwent frequent and important changes through the years. At times, spiritual storms and adversity threatened the very existence of the church. Because of strife between the members and the unchristian attitudes of some, the church’s communing membership dropped from 90 in 1871 to 27 in 1878. Christ Lutheran Church was to encounter many high and low points throughout the next century, but the goals of the first parishioners — offering a place to worship, cooperating with the other churches in the community, and a desire to make worship meaningful and accessible to all — can be seen in the three most successful periods of Christ Lutheran Church in the Twentieth Century. 1920 was a busy time in America as well as the church. The stock market was booming, the Jazz Age was blooming, and Christ Lutheran Church called a new pastor, Jesse E. Stomberger. Pastor Stomberger was to lead the church for the next 28 years through the boom of the 1920s, the Great Depression, and World War II. Jeffersontown was a stable community during these 20 years. It was still a farming community without many new families moving into or out of the area, thus size and growth was not an important issue. Many of the parishioners had grown up in the church and were raising their own families in the church. Being a farming community, the members of Christ Lutheran Church were somewhat insulated from the effects of the Depression. According to John Stomberger, the son of Pastor Stomberger, there was not much money to spend, but everyone in the church had plenty to eat. Each year, Harvest Sunday was celebrated with farmers bringing their food to share with the congregation. Members were heavily involved in Luther League, and Ladies Aid. The church council was comprised of Elders, Deacons, and Trustees. Sunday school was an important part of the life of the church. At one point, Sunday school attendance reached an average of 300 people on Sunday mornings. Oscar Elbert recalled teaching his Sunday school class underneath the church stairs due to lack of space. According to John Stomberger, there were times when his father was bemused by the fact that on some Sundays, more people attended Sunday school than attended worship service. During World War II, 49 members left the church to defend America’s freedom and the church grieved the loss of three of their own. The Louisville Lutheran Home was begun in 1926 and was an important project of the Lutheran congregations in Louisville. It was across the street from the Watterson Trail church location. With the end of World War II, America and Christ Lutheran Church went through a number of significant and sometimes painful changes. Pastor Stomberger retired in 1948. General Electric and Ford built plants in Eastern Jefferson County, bringing industry and new people to the area. Christ Lutheran Church built a new building at its present site in 1957. Equipped with a modern, well-designed plan, in a different location, the membership and activity of the congregation soared to new heights. The average attendance jumped from 227 in 1957 in the old church to 292 in 1958 in the new church. It was during this period that two important services to the community originated. A Boy Scout Troop was successfully launched; and a weekday Kindergarten began to operate. Pastor Irwin resigned in 1961 and Reverend Herman Fisher, Jr. became pastor of Christ Lutheran in 1961. The congregation continued to thrive. A Teen Club proved to be a success with a membership of 200 and an average attendance of 125. The first intern program for Christ Lutheran started in 1963 and proved to be a great assistant to the Pastor. Pastor Fisher left the church and accepted a call in December, 1963 to First United Lutheran Church in Hammond, Indiana. Pastor BeMiller accepted the call from Christ Lutheran Church in 1964, and stayed with the church for the next 32 years. The new pastor was young and a “family man,” much as the majority of the congregation at that time. Pastor BeMiller has a wife and three young daughters, and he had a tremendous amount of energy to channel into Christ Lutheran Church. As Jeffersontown grew, it developed subdivisions and widened its main roads. Pastor BeMiller’s time as pastor saw the choir grow to three choirs, Vacation Bible School was added, two youth groups were created, as were bowling, softball, and volleyball teams. The church continued its service to its families, young members and children in the spirit witnessed during Pastor Stomberger’s tenure. Pastor BeMiller’s worship services were considered on the cutting edge, using the most contemporary liturgy available. Several interns and two assistant pastors (Bob Karli and Dorothy Feightner) were hired through the years to assist Pastor BeMiller. The church added classrooms and a gymnasium, and called an assistant pastor, Pastor Harter, in the 1980s to work with the youth of the church. Church attendance and growth was relatively static for the latter third of Pastor BeMiller’s tenure. As new people from out of town and out of state moved into Jeffersontown, a new Lutheran church, Ascension Lutheran was built in Eastern Jefferson County giving Christ Lutheran Church its first “competition” for Lutherans in the Jeffersontown area. On August 11, 1991, Pastor Harter died suddenly. This left the congregation in deep grief. Many were broken-hearted and the congregation felt the impact of decreased interest in activities. In 1996, Pastor BeMiller retired and moved to South Carolina. Pastor Harter’s death and Pastor BeMiller’s retirement left a tremendous vacuum in knowledge and leadership for Christ Lutheran Church and the parishioners again found themselves seeking a new pastor. The 1990’s saw Jefferson County’s community become much more fluid with families and children moving into and out of areas as employment demanded. In 1996, the congregation made a significant decision to focus on the education of its youth, discontinuing its use of interns and hiring Tom Pairan to work with Christian education and youth ministries. In 1998, the church called its current pastor, Pastor Ron Poisel. Pastor Poisel came from Richmond, Indiana, with his wife Sandy and son John. Christ Lutheran Church is in the process of once again making efforts to serve its younger families and the children in the church. It is working on better use of its available space, and making the church a more inviting place for visitors. Parishioners continue to take responsibility and leadership for the church. The church continues to see its preschool and kindergarten grow, along with Vacation Bible School attendance. Christ Lutheran also continues to work with other churches in the community though involvement with Jeffersontown Area Ministries, participating in Hunger Walks, Habitat for Humanity, as well as assisting refugee immigrants in finding new homes. Just as the founders of Christ Lutheran Church sought new homes and a place to worship, Christ Lutheran Church continues to honor that original calling by welcoming visitors and new members, balancing contemporary and liturgical services, and working to make Christ Lutheran a church home and family for all its parishioners. 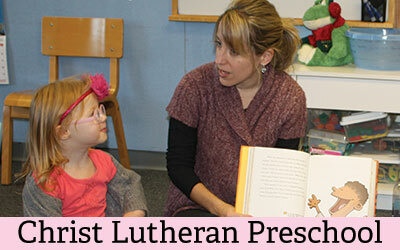 As in the beginning, Christ Lutheran continues the mission of MAKING CHRIST KNOWN.